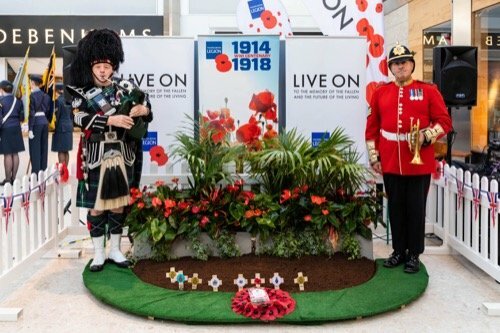 Swansea shoppers are invited to pay their own personal respects this Armistice Day as Quadrant Shopping Centre opens its Garden of Remembrance as part of its Poppy Appeal Week. Taking place on Monday 29 October at 10am,members of the public are invited to join local dignitaries, Lord Lieutenant of West Glamorgan, Bryon Lewis, High Sheriff of West Glamorgan, Henry Gilbert, and the Lord Mayor of Swansea, Councillor David Phillips, to the opening of this symbolic tribute. Honouring service men and women who have given their lives to secure freedom for future generations, Armed Forces ‘sweetheart’, Kirsten Orsborn, will also be singing at the opening ceremony, with an inspiring and poignant performance as well as a performance from children’s performing arts school, Dancerama. Lisa Hartley, Quadrant Shopping Centre manager, said: “This is the third year we have hosted the Garden of Remembrance, which provides a sanctitude for members of the community to come together in respect for our fallen soldiers. This year also marks the 100th anniversary of WW1, and throughout the week, there will be the chance to take part in free arts and crafts sessions where visitors can design their own WW1 poster, design their own poppy and much more. There will also be performances from the likes of the Royal Air Force Cadet Band, City of Swansea Pipe Band, 215 Sqn Military Band and City of Swansea Concert Band, to name a few. All will be helping to raise money and awareness for the Royal British Legion’s Poppy Appeal. Members of the public are invited to the opening ceremony of the Garden of Remembrance, which is taking place on Monday 29 October at 10am. The garden will be open every day from 9am to 6pm until Sunday 4 November. Throughout the week there will also be the opportunity to buy poppies from a dedicated stand in Centre Square. The centre will also be observing the two-minute silence on Armistice Day on 11 November. For more information on Poppy Week and other events taking place at Quadrant Shopping Centre, please go to www.quadrantshopping.co.uk. Image 1: The Piper Bugler performs as part of last year’s opening ceremony for the ‘Garden of Remembrance’ at Quadrant Shopping Centre. Image 2: The opening ceremony gets underway at last year’s ‘Garden of Remembrance’ at Quadrant Shopping Centre. Iamge 3: The Dancerama troupe pose after their performance at last year’s ‘Garden of Remembrance’ at Quadrant Shopping Centre.